For over 100 years, Tolomato Cemetery was the parish cemetery for what is now the Cathedral Basilica of St Augustine, located about a half mile away on the Plaza. There are over 1000 known burials in the cemetery, but few more than 100 markers. Our knowledge of the burials comes from the parish death records, most of which are held in the Diocesan Archives on Aviles St. in St. Augustine. The cemetery is still owned by the Cathedral parish and the Diocese of St Augustine, which have maintained and protected it over the years. There are many historically important burials. The cemetery holds the graves of the first Sisters of St Joseph, and the graves of veterans that represented both sides of the Civil War, including the Freedmen who fought with the Union. It is also the burial site of important political and religious leaders, such as the Second S﻿panish Period governor, Gov. Enrique White, and General Georges Biassou of Haiti, as well as the first Bishop of St Augustine, Bishop Agustin Verot. 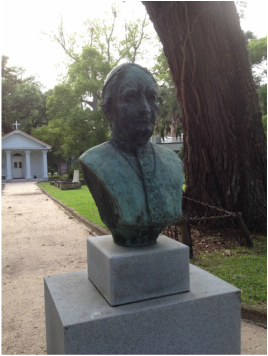 Father Felix Varela of Cuba, whose canonization process is underway, was also buried at Tolomato in 1853. The small white chapel that is the distinctive feature of Tolomato was built to hold his remains by Cubans who had been his students in the seminary in Havana and friends in New York City. 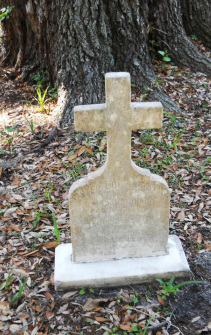 Tolomato also holds the oldest extant marked burial in the state of Florida, the vault of Elizabeth Forrester, a 16 year old girl from Philadelphia who died and was buried in 1798 in an above-ground vault with a beautiful and touching marble ledger stone. Over the centuries, the inscriptions and even the features have been worn away, but those that can be read have been preserved, and our collection of historic photos shows us markers that haven't existed within the memory of anyone associated with the cemetery. In fact, even their purpose is unclear: was this feature an ossuary (that is, a place where bones were deposited after they had been removed from a grave so it could be used for new burials), perhaps even a place for remains from the 2nd Seminole War, meant to replicate the pyramids in the National Cemetery, or was it a marker for a gate or fence or was it simply some unusual burial place? There are many things we do not know about Tolomato Cemetery. 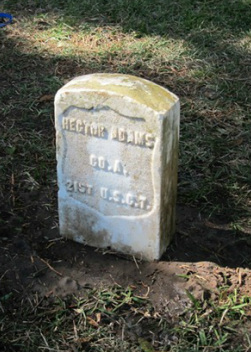 Marker of Hector Adams, a Freedmen who served with the Union Army. Bishop Augustin Verot, d. 1876, the First Bishop of St Augustine. Two of the Sisters of St Joseph, who came from France in 1867 to teach the children of the newly emancipated African Americans. 19th Century photo showing one of the mysterious pyramidal markers.